Meat and meat products industry has been exhaustively searching for quality products. On the other hand, there is an increasing demand of healthier meat products with similar sensory characteristics to traditional formulations. As a result, the development of new ingredient systems has emerged for the creation of products that provide health benefits and higher quality (Doménech-Asensi et al., 2013; Pearson & Gillett, 1996; Weiss, Gibis, Schuh, & Salminen, 2010). One of the major challenges of industry is to delay lipid oxidation, which significantly reduces the shelf life of meat products. In this process, the unsaturated fatty acids undergo a series of reactions involving the simultaneous formation of free radicals. These degradation products must be potentially mutagenic, carcinogenic and sensorially, are responsible for the development of rancidity (off-flavor). Pre-cooked products stored under refrigeration, for example, can develop the flavor of reheating, a phenomenon known as “warmed-over-flavor” (Jiang & Xiong, 2016; Shah, Bosco, & Mir, 2014). Extensive research aiming the identification of new antioxidant compounds from natural sources, resulted in efficient antioxidants extracted from different parts of the plant such as roots, stems, fruits, seeds and bark. Most of these plant extracts are rich in phenolic compounds and provide an alternative to synthetic antioxidants. They help to inhibit lipid oxidation and the degradation of meat pigments, delaying the onset of undesired flavors (Shah et al., 2014). In contrast, studies have shown the possibility of synthetic antioxidants present toxic effects. For this reason, the industry search for natural extracts with high antioxidant potential, low impact on flavor and aroma and economic viability are continuous. Among many types of meat products, bologna is a product consumed all over the world, and in many regions of Brazil it is of great importance in the diet (Horita, Morgano, Celeghini, & Pollonio, 2011). It is defined by the Brazilian legislation as being an industrialized meat product obtained from an emulsion embedded in a specific wrapping and submitted to the appropriate heat treatment. The main physiochemical characteristics allow a minimum of 12% of protein, and maximum of 30% and 65% of fat and humidity, respectively (Brasil, 2000). This type of meat mass is a multiphase system formed by the comminution of lean meat, fat, salt and other ingredients (Gordon & Barbut, 1997). In a meat product, the use of meats of different species presents different characteristics and properties, and fat has a significant influence on the emulsion binding capacity and the oxidative characteristic of the product (Morin, Temelli, & McMullen, 2004; Zorba & Kurt, 2006). Considering the presented above, the main objective of this study was investigate the effect of a preparation based on plant extracts on the oxidative stability of mortadella Bologna type, totally replacing the synthetic antioxidants of the formulation. The type of bologna selected for this study was justified because it presented formulation and process characteristics that are favorable to the oxidative process: composition of several types of raw meat (meat mechanically separated from chicken, beef and meat and pork loin), going through a thermal cooking process and remaining stored above the refrigeration temperature. The plant extracts preparation used was composed of a synergistic combination of natural extracts aiming the application in various types of meat products (fresh, cooked, frozen, fermented, among others). This product was developed by the development and research area of Duas Rodas. The experimental study was conducted using a commercial formulation of a mortadella type Bologna. Three batches were produced, and the synthetic antioxidants sodium isoascorbate (0.1%) and ascorbic acids (0.03%) were substituted by the preparation based on vegetable extracts (0.15 and 0.25%) encoded as AN-1 and AN-2, respectively. The mortadellas were embedded in plastic casings (2.5kg). The evaluation of the oxidative stability of the products was carried out by physico-chemical and sensorial methods during 90 days of storage under a temperature between 18ºC and 22ºC. The determination of thiobarbituric acid reactive substances (TBARS) was performed according to the methodology of the AOCS – Official method of analysis. For measurements of (L *, a *, and b * values) a 45/0, 20mm (BYK-gardner) Color-guide was used. The sensory analysis used the multiple comparison test, which consisted of a standard sample and other coded samples, with one of the coded samples being the placebo standard. The analyst was asked to evaluate the degree of difference of the samples in relation to the standard, using a numerical scale of 5 points: 1 – None, 2 – Slight, 3 – Moderate, 4 – A lot, 5 – Extreme. Twelve trained judges evaluated the sensory attributes of appearance, color, odor, flavor, texture and rancidity. The samples were served in containers at room temperature and analyzed every 15 days. The results were statistically treated by the Tukey test at the 5% level of significance. The results of TBARS are used as an auxiliary analysis for the identification of lipid oxidation. The mortadella presented values with similar variations in the times analyzed. During the storage period, was observed that the AN-1 and AN-2 mortadellas showed similar TBARS values when compared with the standard sample, according to Figure 1. Figure 1 – Variations of TBARS values of mortadellas at different storage times. MA: malonaldehyde. Source: the author. The values of L*, a* and b* of the bologna are shown in Tables 2. At the storage period of 90 days, the color of AN-1 and AN-2 mortadellas did not differ significantly from the standard mortadella. Table 1 – Means of L*, a* and b* of mortadellas in the time of 90 days under temperatures between 18 and 22ºC. Averages refer to three repetitions of analyzes for the same sample. Different letters within the columns indicate significant differences (p <0.05). Source: the author. Sensory analysis were according the physiochemical results, confirming the effectiveness of the natural antioxidant in ilipid oxidation inhibition. Statistically, no significant sensorial differences were observed among the mortadellas, except in the 90-day time for AN-1 mortadella, where a slight difference was found only for the flavor attribute. However, during the tastings, there was a high sensorial preference for AN-1 mortadella, compared to Standard and AN-2 mortadellas. Table 2 – Mean values for sensory attributes of appearance, color, odor, flavor, texture and rancidity of bologna. Temperature: 90 days under temperature between 18ºC and 22ºC. Different letters within the columns indicate significant differences (p <0.05). Source: the author. The study showed the effectiveness of the preparation based on vegetable extracts in the complete replacement of the synthetic antioxidants of the formulation, producing quality bologna. 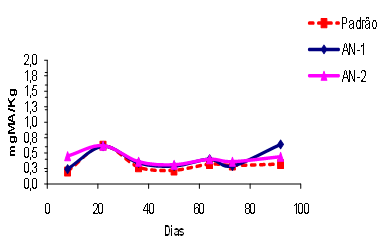 The application of the 0.15% and 0.25% concentrations ensured the conservation of the sensorial attributes during 90 days of storage under temperatures between 18ºC and 22ºC. In this way, in addition to retarding lipid oxidation, the developed preparation presented benefits such as color stabilization and maintenance of the original sensorial characteristics of Bologna mortadella, presenting itself as a solution for the industry that seeks healthier and high quality products. This efficient solution based on natural antioxidants, developed by Duas Rodas, has served the growing need of the processed food industry in the search for healthier and more quality products. André Henrique Marques Luiz is a specialist in the Product Development and Research Department of Duas Rodas, the Brazilian leader in the manufacture of aromas and products for the food and beverage industry.